Has the era of Macintosh clones returned? Well, someone is trying, building and marketing a "Macintosh G6" computer that's just another Intel box - but preloaded with OS X 10.4.3. We're pretty sure these are not Apple authorized, but as we go to press Apple hasn't taken action against these machines. There's a new CPU upgrade guide for Intel Mac mini users, who can now install a 2.16 GHz Core Duo if they want to. And Seagate's "big kahuna" 750 GB hard drive has made its splash, including use in a 1.5 TB (terabyte) RAID drive from OWC. And for those who want to emulate x86 hardware on PowerPC Macs, Guest PC 1.9 has been released. Linsmore states they are also working on a universal binary version of Guest PC. This would allow Macintel owners to run Windows and other x86 operating systems within a window in OS X - no virtualization, no rebooting. "Some nine years after the Apple clones were officially killed off, pirates in South America have resurrected the trade. "Apparently, the latest thing is a 'PowerPC G6 Macintosh', an 'Apple G6 Macintosh-Clone Computer' with a 3.8 GHz Pentium 4...."
"The beasts are being made in China and South America, but unlike the real Apple machines, these clones will cost you only $500." PR: Only 55 percent of consumers who contacted free manufacturer's tech support had their problem solved, according to the latest Computer Tech Support Survey from the Consumer Reports National Research Center. Along with the tech support survey results and Ratings, the June issue of Consumer Reports also includes the latest Ratings of desktop and laptop computers, and a step-by-step guide to easy PC fixes. Consumer Reports surveyed more than 20,000 subscribers with computer trouble and asked how they solved problems with and without manufacturer's help. Consumer Reports survey respondents noted that most manufacturers provided dismal free tech support with two exceptions: Apple's support for desktops and laptops and IBM (Lenovo) for laptops. Apple solved 76% of survey respondents' problems, and IBM (Lenovo) solved 64%. Compaq free tech support solved just 38% of desktop and not laptop problems for survey respondents making it among the worst free tech support programs. Roughly 15% of users with problems didn't even bother to contact the manufacturer's support because of bad past experiences. Fifty percent of respondents who tried solving their own problem after free tech support failed them were successful. Sixty percent of those who asked family and friends for help after free support failed had their computer problems fixed. And, more than 90% of those who skipped tech support entirely and called an independent service at their own expense had their problem solved. Step One: Try to Fix the Problem Yourself. Turn off the computer and any misbehaving equipment for one minute and then restart it. Disconnect and reconnect all the device cables. For trouble with sound or video, review the device's settings (usually in Windows control panel). Consult with a tech savvy friend of family member. Computer users running Windows XP should use System Restore to reinstate the computer's previous settings. Consult Consumer Report's guides. Online user forums and newsgroups may also offer a wealth of free information on similar problems. Step Two: Maximize Free Tech Support. Consider the manufacturer's track record and consult CR's manufacturer's tech support Ratings. Phoning isn't the only way to get free support, but it offers better results than other ways. Keep written notes of important information such as service code, model and serial number. Record what happened and be able to tell the technician exactly what the problem is. Note the technician's name, ID number, or an incident number so that the same tech may continue to help if the call is cut off. Step Three: Consider Independent Support. Paid independent support consultants solved close to 90 percent of the problems that users in Consumer Reports' survey brought to them after manufacturers' support service could not solve the problem. Such services cover computers, peripherals, operating systems, and software, so consumers can avoid the runarounds often encountered with manufacturer's support. Step Four: Prevent Future Problems. Maintain the computer properly. Empty the recycle bin and temporary Internet files. Run Microsoft maintenance tools: ScanDisk, Disk Clean Up, and Disk Defragmenter. Enable Automatic Windows Updates. Delete unneeded items from the Startup menu. Back up your data. Remove dust from vents. Don't install unnecessary software, especially from the Internet. Turn off the computer when not in use for long periods of time. Install antivirus and antispyware programs and use a firewall. Step Five: Weigh Extended Support. For those in the market for a new computer, consider CR's manufacturer's tech support ratings. Some manufacturers offer an extended warranty that you can buy along with a new computer. For most computers brands, such plans aren't worth buying. According to CR's survey, they didn't reduce many of the hassles people experienced with the free support, though they did solve slightly more problems. Complete Ratings of manufacturer tech support, the latest Ratings of desktop and laptop computers, and a step-by-step guide to easy PC fixes is available in the June issue of Consumer Reports magazine which goes on-sale on May 9th. PR: Dell, HP, and Lenovo have jointly announced their support for the newly released DisplayPort 1.0 digital display interface standard developed by the Video Electronics Standards Association (VESA). Dell, HP and Lenovo are VESA members. DisplayPort is designed for broad application in PCs, monitors, TV displays, projectors, and other sources of display content. DisplayPort enables a common interface signaling approach for both internal and external display connections. This approach can reduce overall design complexity, making digital displays such as LCD monitors easier to use and more affordable for customers. The new display interface standard addresses low-voltage operation, enabling integration into the latest generation of silicon process geometries for graphics, while still supporting cost-effective integration into the current generation of LCD panels. "DisplayPort is an excellent customer solution that can provide advantages over current and other emerging interfaces. DisplayPort can enable more-affordable flat-panel displays, support protected high-definition content, and scale performance to meet the demands of next-generation displays by enabling new features and usages. With VESA administering the specification, the industry can take advantage of an open and extensible path for support, compliance, and future upgrades," said Kevin Kettler, Dell's Chief Technology Officer (CTO). Legacy compatibility with DVI 1.0 is also possible for DisplayPort products, providing a means for interoperability with legacy equipment when needed. "HP is proud to be a supporter of the DisplayPort development effort within VESA," said Phil McKinney, vice president and chief technology officer, Personal Systems Group, HP. "This new open standard provides an innovative approach to meeting the future digital display interface needs of the industry and will enrich customers' technology experience." DisplayPort is also designed to efficiently accommodate the higher display resolutions and color depths enabled by Microsoft's next-generation operating system, Windows(R) Vista. This new operating system is designed to provide greatly enhanced support for higher-resolution displays. "Compared with proprietary specifications, DisplayPort introduces an open and extensible solution that protects past investments and supports future innovation, which will ultimately benefit our customers," said George He, Senior Vice President and Chief Technology Officer of Lenovo. The DisplayPort specification also addresses the industry need for a ubiquitous digital interface standard with a compact connector, as well as optional content protection, that can be deployed widely at low cost. A protected digital interface that can be easily deployed on a PC enables broad access to premium content sources such as high-definition movies. The DisplayPort interface is designed to be used for all types of digital display connections, including internal connections in a notebook, monitor, or TV. This capability makes it possible to avoid the costly signal translation from one display format to another that is required with today's display interfaces. Going forward, the micro-packet architecture of DisplayPort can support new innovative features and display product usages that are not possible today with DVI or HDMI. "Granted current costs of the 2.16 GHz CPU are nearly (US) $700, so most wouldn't put that much $$$ into a Mini, but over time prices will fall. (I hope Apple doesn't stop socketing the Intel based Mini and iMac CPUs in the future...)"
"Someone has put together a handy pictorial guide to upgrading the CPU in your Intel-based Mac mini to a higher-end Core Duo. 2.16 GHz anyone? "Having just taken apart my dead G3 iBook to salvage parts, I can tell you that the drill shown in this guide could definitely be a whole lot worse. That said, this is a process not for the feint of heart. Take care!" "Apple is right when it says you should print out the installation instructions that come with Boot Camp, and follow those instructions carefully. With Boot Camp, reading the instructions is not an option. "Having spent the better part of an entire evening on what should have been a one-hour process, I can report that Windows XP will run on an Intel-powered Mac, in my case a new-just-out-of-the-box Mac mini. The mini is a nice little computer, with an 80-gigabyte hard disk drive and 1 gigabyte of RAM, as well as an Intel Core Duo processor. "The installation process was delayed in part because I had to update both the operating system on the Mac mini and its 'firmware,' the software embedded in the computer's hardware. I then had one hiccup with the Windows installation - a mistyped character when entering the Windows product key - and had to go to lengths to undo the damage." Link: Mac mini 1.66 GHz Intel Core Duo versus iMac Intel Core Duo 1.83 GHz 17"
"Over the past several years, hard drive capacities have ratcheted up, but the increases have been incremental. Recent 500 GB drives, including Seagate's own Barracuda 7200.9, have been four-platter designs. Typical platter capacities for most recent-generation hard drives have ranged from 125 to 133 GB per platter, only up a bit from the previous 100 GB per platter. "Now, Seagate is shipping its 7200.10 series, including a suite of products that differ only in the amount of buffer available or in the disk interface. SATA 3 Gbps drives include the ST3750640AS, offering a 16 MB cache, while the ST3750840AS ships with 8 MB. Also available are the ST3750640A and ST3750840A, which are the 16 MB and 8 MB parallel ATA versions, respectively. Other models are available in lesser capacities, including 500, 400, 320, 300, 250 and 200 GB models. Platter densities may vary somewhat, with the flagship 750 GB drives packing In 187.5 GB per platter, while the 200 GB drive is a single-platter design." PR: The new MiniHitch & CamHitch allows you to mount your Mac mini and your iSight on the back of your monitor by making use of the 100mm or 75mm spacing VESA pattern mounting holes found on the back of many LCD monitors. Stylish design as well as practical, it frees up your desk space, as well as protects your Mac mini from scratches. The MiniHitch allows you to mount your Mac mini on the back of your monitor, by making use of the 100mm or 75mm spacing VESA pattern mounting holes found on the back of many LCD monitors. Slick design as well as practical, frees up your desk space, as well as protects your Mac mini from scratches. The MiniHitch's versatile design also allows it to be used as a stand-alone protective shell for your Mac mini, looks great upright or flat. The MiniHitch comes complete with mounting hardware. The MiniHitch is compatible with many of today's standard LCD monitors that come with 75mm or 100mm spacing VESA pattern Mounting holes on the back of the monitor. 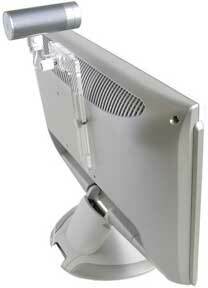 NOTE: Some monitors have the support stand attached to the VESA mounting holes. The MiniHitch is not compatible with these types of monitors. Hole Pattern compatibility: 75mm & 100mm VESA Mounting Pattern. If you just like it for it's stylish looks, and need to maximize desk space, or protect your Mac mini from scratches, the MiniHitch's versatile design allows it to be used as a stand-alone protective shell for your Mac mini as well. Small footprint, vertically stable, easy access to disk slot, will look great on your desk! Prefer to use it flat? No problem. The MiniHitch comes with rubber bumper feet so it won't slip around on your desk. 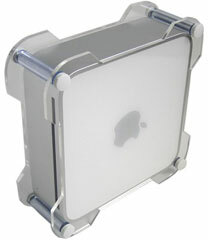 Protects your Mac mini from scratches, easy access to disk, looks great too. The CamHitch allows for variable height extension of your iSight by adjusting the slot position. 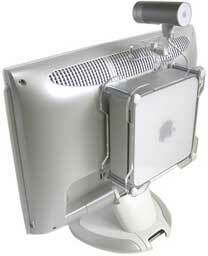 Makes use of the notebook mount that comes with the iSight as well as of one of the mounting holes found on the back of many LCD monitors. Unobtrusive design, easy mounting. Maximum height achievable puts the center of the iSight camera at 8" from the mounting hole. The CamHitch Comes complete with mounting hardware. NOTE: Some monitors have the support stand attached to the VESA mounting holes. The CamHitch is not compatible with these types of monitors. Mounting Screws Compatibility: M4/.7 thread. This package combines the MiniHitch & CamHitch. The Combo give you the ability to mount both your Mac mini and iSight on the back of your monitor. Comes complete with mounting hardware. See above for compatibility, specifications and requirements. PR: Other World Computing (OWC) has announced the introduction and immediate availability of the first dual hard drive external FireWire drive RAID available up to 1.5 terabytes ( TB) - 1,500 gigabytes - as a part of its OWC Mercury Elite-AL Pro line of dual drive storage solutions. This new 1.5 TB Elite-AL 800 Pro RAID model, introductory priced and immediately available for $1,149.99, is solidly build with a sleek aluminum design that optimizes durability and function in an extremely portable and compact enclosure only 9.0" L x 2.8" W x 5.8" H.
In celebration of the new 1.5 TB model, OWC has instituted immediate price adjustments on the entire line of OWC Mercury Elite-AL Pro FireWire 800 RAID dual drive storage solutions. All OWC Mercury Elite-AL Pro models are tested and certified for Audio/Video, Music, Movies, Graphics, Backup, General Data, and most standard and expert technology applications and are EMC Backup Certified for direct Retrospect support. High reliability and exceptional performance rankings garnered by the Elite Pro line in major trade and industry press result from OWC's commitment to utilizing the best hard disk mechanisms available in conjunction with Oxford chipset based custom bridge design. Elite-AL Pro 800 RAID solutions have two FireWire 800 ports and one FireWire 400 port and are shipped ready for Plug-and-Play operation complete with FireWire 800 Cable, FireWire 400 cable, EMC Retrospect Backup software, Intech HD SpeedTools utility suite, and a full Two Year OWC Warranty. For additional information contact www.MacSales.com or call toll free (800) 275-4576. PR: Trans Intl offers miniD, a desktop FireWire external hard disk drive solution with fast 1394a repeater and USB hub. 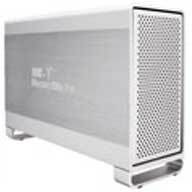 The new miniD is user-selectable, economical storage solution for Mac mini, Choose from our tested, high-performance ATA drives or. select your own standard, off-the-shelf ATA drive to use with miniD F400/USB for high capacity, lowest-cost storage. Auto-adjusting fan regulates fan speed according to temperature of the hard drive. Intelligent power switch will power up and down the drive with your computer. 6.5" x 6.5" x 2"
PR: WiebeTech has released the Fourth Generation of its popular DriveDock series. In addition to its attractive new color, the new series features the latest high performance FireWire bridges and adds multiple powering options and new LED indicators. "We're pleased to introduce these new DriveDocks to the marketplace," said James Wiebe, president and CEO of WiebeTech LLC. "These new features will be immensely valuable when troubleshooting a drive and will make a technician's work and analysis much easier." The DriveDock v4 series is a perfect solution for anyone who wants highest speed FireWire transfer rates and access to bare 2.5" notebook, 3.5" IDE or SATA drives. The Docks feature high performance Oxford Semiconductor bridges: 922, 911+ or 924. Dual FireWire ports allow daisy-chaining for more versatility. A USB port is also included. Multiple power options are available via a +12V adapter (included) or via a standard disk drive 4-pin Molex power source. Generation 4 LED indicators include: FireWire attached, USB attached, +12V input jack active, disk drive power input jack active and +5V/+12V out operational. An on/off switch provides for safe drive power up and power down. Using it is easy. Connect the drive to the Dock, plug in power and attach a FireWire or USB cable to a host computer. For more protection to the drive, a mounting plate can be attached to the dock to protect the drive's circuitry. The DriveDock v4 Series is built from aluminum for durability. Dual daisy-chainable FireWire ports: OXUF911+ (FireWire DriveDock v4, Notebook DriveDock v4); OXUF922 (ComboDock v4); OXUF924 (SATADock v4). USB 2.0 Port: Allows attachment of USB hosts. +12V DC Power In: Allows powering using the included AC adapter. Disk Drive Power In: Allows powering from standard 4-pin drive power connectors as is found in most computers. +12V Power Input LED: Identifies valid power input source on +12V input jack. Disk Drive Power In LED: Identifies valid power input source on 4-pin drive power input socket. Bus-Powered Notebook DriveDock v4: Bus-powered through FireWire 400, needing no AC adapter to power the drive, allowing single cable operation. On / Off Switch: Allows Power Up / Down. FireWire Host Detection LED: Identifies valid FireWire host attachment. USB Host Detection LED: Identifies USB attachment. IDE Cable Connector: Supports attachment to drives inside of computers. Aluminum case: Briefcase tough; excellent heat dissipation. Small size: Fits in a pocket. Data Speeds: FireWire 800: up to 800 Mbps; FireWire 400: up to 400 Mbps; USB 2.0 port: up to 480 Mbps. Operating System: Windows XP, Macintosh OS X, Linux distributions that support FireWire. Dealers may purchase WiebeTech products from Dr. Bott. End users may purchase from PCMall or MacMall. End users may also order from PC Connection and CDW/MacWarehouse. Government customers are encouraged to purchase from www.pcmallgov.com and www.lyme.com. New in Guest PC 1.9? The major aim of the update was to increase compatibility and stability of Guest PC application in Windows configurations. As a result a performance increase of up to 40% and better USB functionality have been achieved. New feature: USB devices are now supported! Guest PC 1.9 is available immediately. at US$69.99 The price includes Family License and free support. Family License allows you to install Guest PC on all computers in your family. All current customers get a new Guest PC 1.9 version at no charge. To learn more about Guest PC, please visit Lismore Software Systems website. For more deals on current, recently discontinued, and older notebooks, see our MacBook Pro deals, 12" PowerBook G4 deals, 15" aluminum PowerBook G4 deals, 17" PowerBook G4 deals, titanium PowerBook G4 deals, iBook G4 deals, PowerBook G3 deals, and iBook G3 deals.